If you know anything about me, you know that I am a Cleveland fan through and through. I love anything about my city and I will fight you until you cry to prove it, especially if we are talking about sports. Looking at all of the Cleveland sports teams, the Browns are the team that fans always cling to the concept of "Next Year" while wallowing in sorrow from the past season. There is always next year. Next year we will get the quarterback, coach, whatever. Next year we are going to the playoffs. You get the point. That roller coaster of emotions makes it tough to be a Browns fan, always waiting for next year. Looking at our players - as a fan -I had to cling to a hope that we are really going to win one day. Starting with the hope of winning a game. 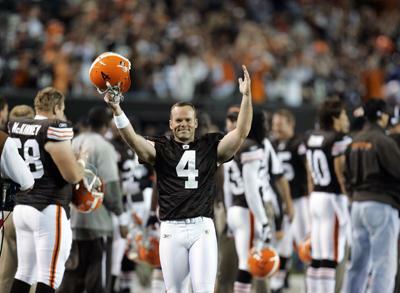 That hope for me is Phil Dawson. Yes, before we go on, he is a kicker. A damn fine kicker, but yes, at the end of the day he is *just* a kicker. Dawson is going to go down in Browns lore as the best kicker in Browns history. More then that, the man is the epitome of clutch. This year in the game against the Chargers, he scored all 15 points. Whoa. But, still, he is just a kicker. Right? At some point I decided to stop throwing my money to players that would be gone after a season (so says the 3 Charlie Frye jerseys hanging in my closet), and go for the long term guy, Phil Dawson. But still, a kicker? Do you remember those Life's Little Instruction Books? Everyone got one for graduations, birthdays, and any other occasion you needed a warm fuzzy kick in the pants for. The books are filled mostly with little wisdom nuggets that you wish you wrote down and made a fortune from book out of. Stuff like, "Root for your team to win, not the other team to lose" or "Never buy a car wearing your good watch." In general, good advice. One that stuck with me was a long quote to the effect of going to a college baseball game and cheering and making good luck signs for the left fielder. Interesting concept. The left fielder is just as important as any other guy on the team, except the home run star or the closer get the glory. Talk to a guy that missed a fly ball in left field and he would agree. That is part of why I root for Phil Dawson. Well, at least in the beginning. There were so many bad seasons that I had to look for a glimmer of hope. The first few times I wore my Dawson jersey, other fans would give me a sideways look and then it caught on. The weird looks transformed to excited high fives and stories of how Awesome Dawson is and how someone's cousin met him and he was great or someone saw his wife at the store and she was friendly. 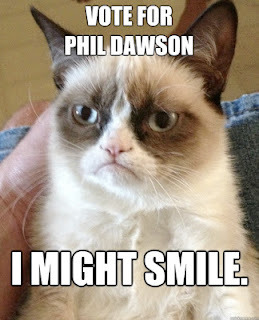 I have yet to find anyone in the city of Cleveland to make a negative comment about Dawson. In this city, that my friends, is a testament to his sheer awesomeness. This year, it seemed particularly egregious to me that Phil Dawson has never made it to the Pro Bowl. For some reason I couldn't shake the fact that he needed to be there. Maybe it was all of the Life's Little Instruction Book's that I grew up with, but I felt like the fans had to do something. In the era of LeFoolio, we have in Dawson, who by all accounts, is a great guy that wants nothing more than to win for his team. How can we not support that? 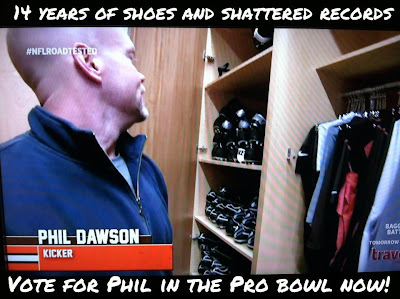 In the age of social media, I took it upon myself to get Phil Dawson to the NFL Pro Bowl through sheer will and repetitive messages. If Cleveland could select a chucklehead like Peyton Hillis to the cover of Madden, the least we could do is get Dawson to the Pro Bowl. My efforts did not go unnoticed. I received tweets from the NFL and OMG Phil Dawson himself. 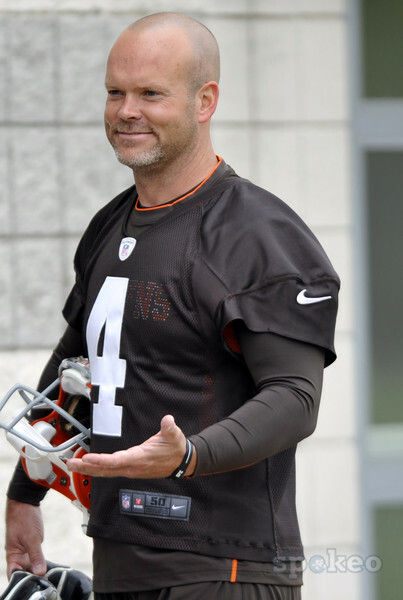 Thankfully, my Phil Dawson memes did not enrage people and the fans of Cleveland got behind the campaign and didn't ostracize me for my fervor. Something clicked and Phil Dawson to the Pro Bowl campaigns sprung up everywhere. Even Browns punter Reggie Hodges pushed for Dawson to go the Pro Bowl. It was amazing to not be the only one talking about Dawson. In the end, we did it. As fans, we made the right decision and supported a guy that has been with us since the team came back in 1999. No matter how awful the game, or crappy the weather, Dawson went out there and made seemingly impossible kicks (Ahem, Ravens game anyone?) week after week. He is the reason we were even in contention for most games as of late. Through shares and retweets and clicking and fan voting, Dawson finally made it to his first Pro Bowl this year. In my excitement, I sent Phil a tweet to see if he would answer questions for this little blog, since we are best buddies and all. To my surprise, he answered. And that comment shows you what type of guy Dawson is. He is the kind of guy that other plays got excited for when he made the Pro Bowl. Dawson may be Texas proud, but he will always have a special place in the heart of Cleveland. Let's hope the Browns brass realize that and keep him on. 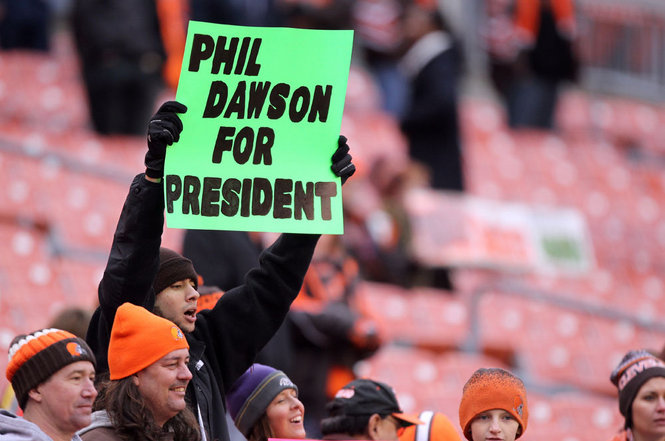 I'm not sure they are ready for a Dawson To Retire As A Brown campaign. The man who has been through the worst and best (whatever that is) of this team. As you said, a special player in the era of "what-about-me" athletes.